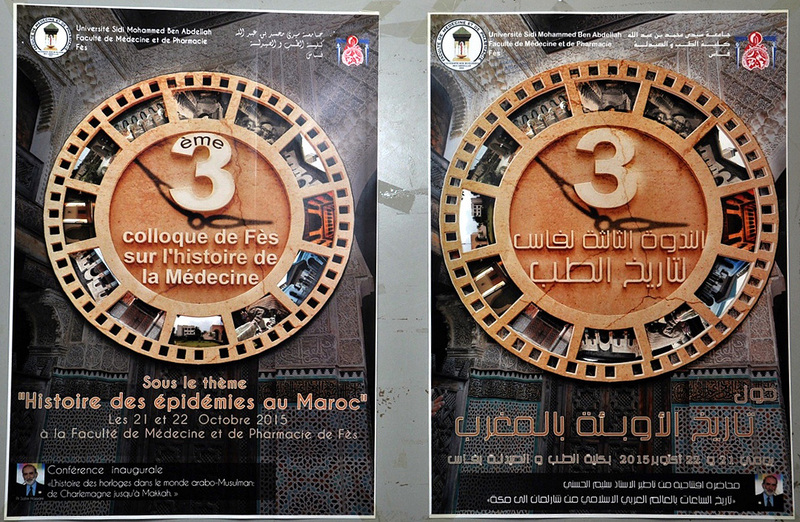 On 22-23 October 2015, the “3rd International conference on History of Medicine and Cures (Colloque international de l’histoire de medecine)” was opened at Fez university of Sidi Mohammed ben Abdullah (Faculté de Médecine et de Pharmacie de Fès). Professor Salim Al-Hassani gave the keynote presentation. 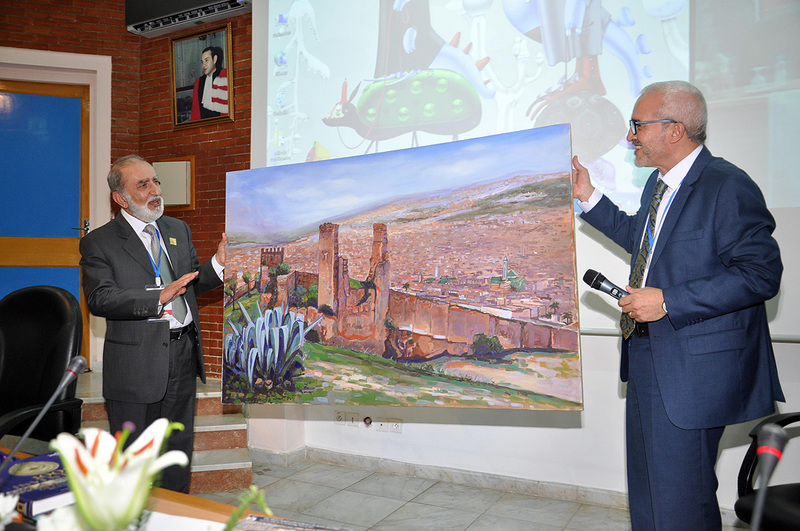 (From right) Professor Assobhei Omar, President of Sidi Mohammed ben Abdullah university, Fez.presenting a painting of the old city of Fez to Professor Salim Al-Hassani. The president of FSTC, Professor Salim Al-Hassani's presentation told the story of how, a 1000 years ago, men and women of different faiths and cultures built upon the achievements of previous civilisations to generate thousands of new scientific inventions and beneficial innovations that transformed their world in science, technology, medicine, architecture, art, business and education. Professor Salim Al-Hassani delivering his keynote speech. Examples were used of fascinating water clocks from the Muslim world, especially the Al-Qarawiyyin mosque astronomical clock and the Bou-Inania Mangana clock of Fez. A 3D model animation of the clock that Harun al-Rashid gifted to King Charlemagne was shown with sound. Other detailed animations of clocks such as Ibn al-Haytham’s, Al-Jazari’s elephant clock and the mechanical clock of Taqi al-Din. The presentation highlighted how one of FSTC’s global initiatives, 1001 Inventions, is engaging millions of young people in learning how people from many cultures worked together in the fields of science, technology and innovation and built a better society for those that came after them. This historical example provides a bedrock of learning and inspiration for how they might work together to build a better, smarter society. It alluded to a new initiative entitled 1001 Cures, which aims at bringing fascinating stories on medicine and healthcare from non-European civilisations over a 1000 year period. 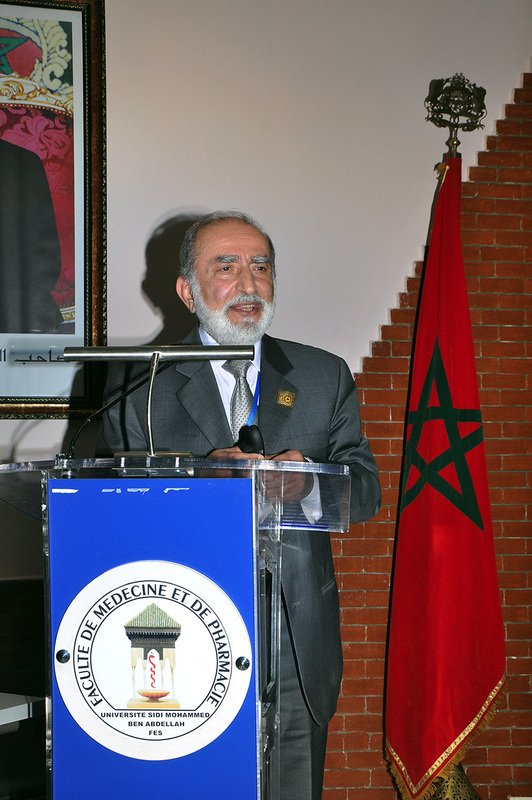 Professor Al-Hassani explained that for the building of a smart knowledge society, the most important asset, i.e the young generation, would have to be motivated and transformed so that their aspirations resonate with the leadership vision. For this to happen effectively, they need to look afresh at the past to re-perceive it and learn from it. Stories of exemplary role models would inspire them to focus on transforming their society and build a better future for humanity. To achieve this, a supportive educational environment will be required. A principal feature of this environment will be that it ensures a curriculum, which balances science and technology, and recognises scientific contributions of all cultures; a feature missing from present STEM courses in schools and universities.